Thousands of civilians are reported to be fleeing from Pagak towards Ethiopia, amidst reported fighting in Pagak, a rebel stronghold. 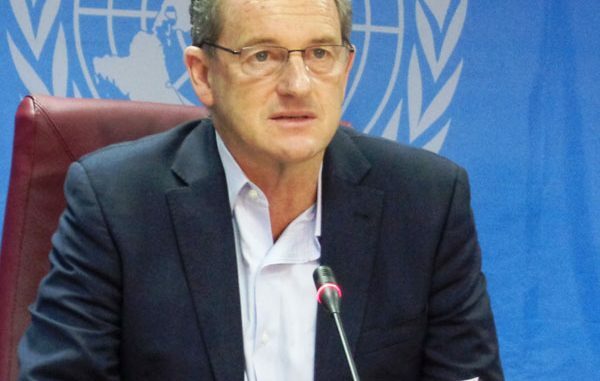 JUBA, 13 July 2017 [Gurtong]-David shearer, Special Representative of the Secretary General of the United Nations Mission in South Sudan (UNMISS), told a news conference in Juba on Wednesday that according to information from International Organization of Immigration (IOM), about 5,000 people from the area north of Pagak have been registered before passing into Ethiopia as refugees. He said due to the growing insecurity in the area, at least 25 aid workers have been forced to relocate from Pagak and the surrounding areas. “These south Sudanese citizens are fleeing on an advance of government SPLA troops towards Pagak,” he said. Pagak is a stronghold of the opposition under Riek Machar. Shearer said there has been an active military engagement over the past week, with heavy fighting around Mathiang north of Pagak on July 2nd. He said according to reports, government forces are now approaching the town of Maiwut, 25 kilometers north-west of Pagak. “I am gravely concerned by this ongoing situation,” he said. “And while it is not clear which side begun the fighting, the military advance by the SPLA is not in the spirit of the unilateral ceasefire declared by the government in May of this year,” said shearer. He asked both sides to observe president Kiir’s independence message of peace, and cease hostilities to allow civilians to return to their areas. However, Brigadier General PSC Lul Ruai, SPLA Spokesman denied there is any fighting in Pagak. Lul said the concerned civil authorities including UN agencies, local and international NGOS operating in the area should tell what is making the civilians to flee to Ethiopia. “As far as SPLA is concerned, we are not aware about what is happening in Pagak,” he said. The army spokesman said the SPLA is still at its defensive positions at Mangok and Guelguok and had moved not an inch in compliance with president Kiirs’ declaration of unilateral ceasefire to give conducive environment for the National Dialogue. Victoria Beckham: Not A Good Sport? TOM CRUISE : DOES ANYONE CARE IF HE DID HIS OWN STUNTS? What Will Become Of Olivia Jade’s Sephora Palette?